Samuel Langhorne Clemens was born in Florida, Missouri, on Nov. 30, 1835, the sixth child of John and Jane Clemens. Several years later, in 1839, the family moved to nearby Hannibal, where Clemens spent his boyhood years. During his youth, Clemens had a strong tie to the Mississippi River, along which his town was located. Steamboats landed at the prosperous town three times a day, and Clemens' boyhood dream was to become a steamboatman on the river. Clemens' newspaper career began while still a boy in Hannibal. In 1848, a year after his father's death, he was apprentice to printer Joseph Ament, who published the Missouri Courier. By the age of 16, in 1851, Sam was working for his brother Orion's Hannibal Western Union, for which he wrote his first published sketches and worked as a printer. Over the next two years, he continued at the Western Union, occasionally taking stints as editor in Orion's absence. In 1852, Sam published several sketches in Philadelphia's Saturday Evening Post. Clemens left Hannibal in 1853, at age 18, and worked as a printer in New York City and Philadelphia over the next year. During his trip east, he published travel letters in the Hannibal Journal. Upon returning to the Midwest in 1854, Clemens lived in several cities on the Mississippi; the most prominent of these was Keokuk, Iowa, where his brother Orion founded the Keokuk Journal. By 1857, a 21-year-old Clemens was in New Orleans, seeking a berth on a ship going to South America, when he met steamboat pilot Horace Bixby. He persuaded Bixby to accept him as an apprentice and teach him the Mississippi for a fee of $500. After living on the river for two years as a cub pilot, Sam received his pilot's license in 1859, at the age of 23. With the start of the Civil War, in April 1861, river traffic on the Mississippi was suspended, and Clemens' steamboat pilot career came to an end. He joined a volunteer militia group called the Marion Rangers, which drilled for two weeks before disbanding. By the summer of 1861, Sam accompanied Orion to the Nevada Territory by stagecoach; Orion had been appointed by President Lincoln as secretary of the new Territory, and Sam was to be his secretary. In 1861, the Nevada Territory was being inundated with gold and silver prospectors, inspired by the 1858 discovery of the Comstock Lode, one of the largest metal deposits in the world. Almost immediately upon reaching Nevada, Clemens became involved with mining, travelling to some of the most promising prospecting regions, including Humboldt, Esmeralda, and Aurora. Clemens never did strike it rich, and was forced to work in a quartz mill to support himself. Clemens had been sporadically contributing humorous letters to the Virginia City Territorial Enterprise, the territory's most well-known newspaper, and, by September 1862, was accepted a job to be a reporter for the paper, at $25 a week. Clemens covered the territorial legislature, local news items, and contributed humorous pieces. During his stint at the Enterprise, the 27-year-old Clemens was greatly influenced by Joseph Goodman, the paper's founder, and Dan De Quille, a star writer; both men would be friends of Clemens for years to come. After 17 months, Clemens left the Enterprise for San Francisco, apparently to avoid antiduelling laws after challenging a rival editor to fight. Arriving in San Francisco in 1864, Clemens went to work for the Call, a local paper, as a full-time reporter, and then was the Pacific correspondent for the Territorial Enterprise. Clemens was based in San Francisco for the next four years, writing for Golden Era, the Californian, and other publications. He was a central figure in the literary scene of the city, which included Bret Harte, C.H. Webb, and others. In 1866, he took a four-month trip to Hawaii as a correspondent for the Sacramento Union. Upon returning to San Francisco, a 30-year-old Clemens capitalized on the success of his "Sandwich Islands" letters by organizing a lecture on the topic. The success of this venture prompted him to arrange his first lecture tour, a two-month swing through northern California and western Nevada. For the remainder of his life, Clemens was to be one of the most loved and coveted speakers in the United States. Clemens left California at the end of 1866, and headed to New York City. Shortly after arriving there, he arranged to be a correspondent for the San Francisco Alta California aboard the Quaker City, which was departing for a voyage to Europe, Russia, and the Middle East. Before departing on the trip, Clemens arranged to publish his first book, The Celebrated Jumping Frog Of Calaveras County, And Other Sketches, a collection of published stories from his Western days. He also performed his Sandwich Island lecture at the Cooper Union, New York's largest hall, and took a lecture tour through the Missouri and Iowa, including a return stop in Hannibal. Through his lecture tours and his popular letters from the Quaker City, the 31-year-old Clemens was becoming quite a well-known celebrity. Upon returning to New York, Clemens accepted a position as secretary to Senator William M. Stewart, in Washington, D.C. He was asked by Elisha Bliss, of the American Publishing Co., to write a book about his Quaker City experiences, which would become The Innocents Abroad, released in July 1869. Also, shortly after returning to New York, Clemens met Olivia (Livy) Langdon, the older sister of Jervis, a friend from the Quaker City trip. The following year, 1868, was a busy one for Sam. He travelled back to California and Nevada on a lecture tour, finished Innocents in San Francisco, published several sketches in various publications, and began courting Livy. By the end of the year, Sam, now 33, became secretly engaged with Livy to be married. Over the next two years, Clemens travelled extensively on lecture tours around the East and Midwest, published his book, bought an interest in the Buffalo Express, and wrote numerous sketches. With his marriage in 1870 to the 25-year-old Livy, Clemens' life took a dramatic turn toward stabilization and normalcy. The couple settled down in Buffalo, N.Y., in a house bought by Livy's father, and Sam worked on the Express as editor. He also wrote a monthly column for the Galaxy, a New York literary magazine. Besides all of this activity, Clemens contracted to write Roughing It, an account of his experiences in Nevada and California. During this period in 1870, however, tragedy struck the young couple. First Livy's father died; then her close friend died while staying with the Clemenses; finally, their first child, Langdon, was born premature, and lived only two years in a sickly state. The situation stabilized the following year, when Sam rented a house in Hartford, Conn.'s, upper class Nook Farm. He published Roughing It, continued on lecture tours throughout the country, bought a parcel of land in Nook Farm on which to build a house, and visited England for the first time. In March 1872, Susy Clemens is born. On a return trip to England with his family in 1873, the 38-year-old Clemens, by this time a substantial literary celebrity, met such notables as Ivan Turgenev, Robert Browning, Anthony Trollope, and Lewis Carroll. He also published The Gilded Age, with Charles Dudley Warner, his first fictional book. By June 1874, Sam and Olivia's second daughter, Clara, was born. Their third and final child, Jean, was born in 1880. Now settled into his own home in Hartford, Clemens devoted himself to writing novels and sketches, and performing the occasional lecture. It was the period of Clemens' greatest literary output. At this time, Sam began tapping into his youthful experiences in Hannibal as material for some of the most famous novels in his catalogue  The Adventures of Tom Sawyer, published in 1876; Life On The Mississippi, 1883; and Adventures of Huckleberry Finn, 1885. The family spent a year and a half in Europe, in 1878/79, in order for Sam to collect material for a travel book, which resulted in 1880's A Tramp Abroad. A year later, The Prince And The Pauper was released. This was Clemens' first attempt at writing historical fiction with a serious theme, a marked departure from the humorous books of his earlier career. Another classic historical novel, although more satirical, was A Connecticut Yankee In King Arthur's Court, released in 1889. Although now a settled family man, Clemens managed to partake in several lecture tours around North America in 1884/85. Dissatisfied with most of his publishers, Clemens founded his own publishing company in 1884, called Charles L. Webster & Company. The firm was in existence for 10 years, and was an early success after the publication of Ulysses S. Grant's memoirs in 1886, and reissues of Twain's earlier books. From 1887 on, however, the company faced difficulties and suffered setbacks, finally closing its doors in 1894 due to bankruptcy. During the 1880s and early 90s, Clemens became heavily involved with investing in the Paige compositor, an automatic typesetting machine. He poured great amounts of money in the machine, and even founded a company in 1886 to manufacture and distribute it. The advent of the linotype machine, however, sent the Paige compositor to its doom. After the second model of the machine failed a test run at the Chicago Herald in 1894, where 32 linotypes were running smoothly, the machine was scrapped. Clemens contributed to the bankruptcy of his publishing company when he shifted funds from that firm into the compositor. By the early 1890s, Clemens' financial situation was in poor shape as a result of these failures, and the cost of living an extravagant social lifestyle at the house in Hartford. In order to stave off personal bankruptcy, Sam closed down the Hartford house in 1891, and took the family to live in Europe. Throughout most of the decade, the Clemens family lived at various addresses in France, Germany, Switzerland, and Italy. 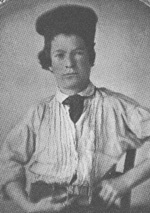 Regardless of his financial situation, though, Clemens still managed to finish numerous novels and sketches; the most prominent of these were The American Claimant (1892), Tom Sawyer Abroad (1894), Pudd'nhead Wilson (1894), Personal Recollections of Joan Of Arc (1895), and "The Man That Corrupted Hadleyburg" (1898). In 1895/96, Clemens and family undertook an around-the-world lecture tour, which also provided him with material for his final travel book, Following The Equator (1897). Tragedy struck during the tour, however, when eldest daughter Susy died in Hartford in 1896, a tragic blow to the family. By 1898, Clemens had managed to pay off all of his creditors, a feat that elevated him to heroic status in the eyes of the public. Providing invaluable financial assistance during this time of financial hardship was Standard Oil executive Henry Rogers. In 1900 and 1901, Clemens lived in New York City (14 West 10th St.) and in Riverdale, N.Y., just outside the city. He lectured extensively during this period, and took an active role in New York's social scene. Yale University presented him with an honorary degree in 1901, and the University of Missouri did likewise in 1902. Shortly after buying a house in Tarrytown, N.Y., Livy became seriously ill and spent long periods of isolation in Maine, before being advised to seek the warmer climate of Florence, Italy, in late 1903. Sam and Livy were apart for most of the time leading up to her death in Florence in June 1904. Clemens spent the years following Livy's death primarily in New York City. After selling the Tarrytown house in 1904, he lived at 21 Fifth Ave. until 1908, primarily writing and making public appearances. In 1905, Clemens dined at the White House with Theodore Roosevelt, and a gala 70th birthday banquet was held at Delmonico's in New York. In 1907, Clemens received an honorary degree from Oxford University. Twain's more significant writings during the first decade of the 20th century included: "A Double-Barrelled Detective Story" (1902), "Was It Heaven? or Hell?" (1902), Extracts From Adam's Diary (1904), Eve's Diary (1906), What Is Man? (1906), Chapters From My Autobiography (1906/07), Extract From Captain Stormfield's Visit To Heaven (1908), and Letters From The Earth (1909). By 1908, Clemens moved into his final home, a residence in Redding, Conn., which he called Stormfield. During the final years of his life, Clemens organized the Angelfish Club, an informal organization of schoolage girls, called Angelfish, whom he kept in correspondence with and invited to stay with him. Declaring himself the admiral of the club, Clemens set the rules for admittance: sincerity, good disposition, schoolgirl age, and intelligence. The billiard room of Stormfield was the offical headquarters, and various other parts of the house were given fish-related names. Sam also set the rule that any Angelfish who went three months without writing to him would be suspended. Although this setup might appear inappropriate, Clemens' relationship with the girls appears to have been fully platonic. In December 1909, Clemens' youngest daughter, Jean, died at Stormfield. Immediately after this tragedy, Twain wrote "The Death Of Jean", the last substantial writing he completed. The piece recalled the sudden tragedy of the death, and his feelings regarding the loss of his other family members. Following its completion, Clemens vowed never to write again. Clemens' health rapidly deteriorated after Jean's death. In January 1910, he went to Bermuda for his health, but sensed that he wasn't to live long. On April 21, 1910, Clemens sank into a coma at Stormfield. At sunset, his heart failed and he died in his bed. He was 74 years old. On April 23, a large funeral procession was held in New York City, and a service was held at the Presbyterian Brick Church. Clemens was buried alongside his wife and children at Woodlawn Cemetary, in Elmira, N.Y. In November 1835, at the time of Clemens' birth, Halley's Comet made an appearance in the night sky. Strikingly, the comet's next appearance came during April 1910, the period of Clemens' death. Throughout his life, Clemens said that he would "go out with the comet," knowing the 75-year span between the comet's appearances. His prediction was amazingly accurate. It was a time of great and exalting excitement. The country was up in arms, the war was on, in every breast burned the holy fire of patriotism; the drums were beating, the bands playing, the toy pistols popping, the bunched firecrackers hissing and spluttering; on every hand and far down the receding and fading spread of roofs and balconies a fluttering wilderness of flags flashed in the sun; daily the young volunteers marched down the wide avenue gay and fine in their new uniforms, the proud fathers and mothers and sisters and sweethearts cheering them with voices choked with happy emotion as they swung by; nightly the packed mass meetings listened, panting, to patriot oratory which stirred the deepest deeps of their hearts, and which they interrupted at briefest intervals with cyclones of applause, the tears running down their cheeks the while; in the churches the pastors preached devotion to flag and country, and invoked the God of Battles beseeching His aid in our good cause in outpourings of fervid eloquence which moved every listener. It was indeed a glad and gracious time, and the half dozen rash spirits that ventured to disapprove of the war and cast a doubt upon its righteousness straightway got such a stern and angry warning that for their personal safety's sake they quickly shrank out of sight and offended no more in that way. Sunday morning came--next day the battalions would leave for the front; the church was filled; the volunteers were there, their young faces alight with martial dreams--visions of the stern advance, the gathering momentum, the rushing charge, the flashing sabers, the flight of the foe, the tumult, the enveloping smoke, the fierce pursuit, the surrender! Then home from the war, bronzed heroes, welcomed, adored, submerged in golden seas of glory! With the volunteers sat their dear ones, proud, happy, and envied by the neighbors and fiends who had no sons and brothers to send forth to the field of honor, there to win for the flag, or , failing, die the noblest of noble deaths. The service proceeded; a war chapter from the Old Testament was read; the first prayer was said; it was followed by an organ burst that shook the building, and with one impulse the house rose, with glowing eyes and beating hearts, and poured out that tremendous invocation *God the all-terrible! Thou who ordainest! Thunder they clarion and lightning thy sword! * Then came the "long" prayer. None could remember the like of it for passionate pleading and moving and beautiful language. The burden of its supplication was, that an ever-merciful and benignant Father of us all would watch over our noble young soldiers, and aid, comfort, and encourage them in their patriotic work; bless them, shield them in the day of battle and the hour of peril, bear them in His mighty hand, make them strong and confident, invincible in the bloody onset; help them to crush the foe, grant to them and to their flag and country imperishable honor and glory-- An aged stranger entered and moved with slow and noiseless step up the main aisle, his eyes fixed upon the minister, his long body clothed in a robe that reached to his feet, his head bare, his white hair descending in a frothy cataract to his shoulders, his seamy face unnaturally pale, pale even to ghastliness. With all eyes following him and wondering, he made his silent way; without pausing, he ascended to the preacher's side and stood there waiting. With shut lids the preacher, unconscious of his presence, continued with his moving prayer, and at last finished it with the words, uttered in fervent appeal, "Bless our arms, grant us the victory, O Lord our God, Father and Protector of our land and flag!" The stranger touched his arm, motioned him to step aside--which the startled minister did--and took his place. During some moments he surveyed the spellbound audience with solemn eyes, in which burned an uncanny light; then in a deep voice he said: "I come from the Throne--bearing a message from Almighty God!" The words smote the house with a shock; if the stranger perceived it he gave no attention. "He has heard the prayer of His servant your shepherd, and will grant it if such shall be your desire after I, His messenger, shall have explained to you its import--that is to say, its full import. For it is like unto many of the prayers of men, in that it asks for more than he who utters it is aware of--except he pause and think. "God's servant and yours has prayed his prayer. Has he paused and taken thought? Is it one prayer? No, it is two--one uttered, the other not. Both have reached the ear of Him Who heareth all supplications, the spoken and the unspoken. Ponder this--keep it in mind. If you would beseech a blessing upon yourself, beware! lest without intent you invoke a curse upon a neighbor at the same time. If you pray for the blessing of rain upon your crop which needs it, by that act you are possibly praying for a curse upon some neighbor's crop which may not need rain and can be injured by it. "You have heard your servant's prayer--the uttered part of it. I am commissioned of God to put into words the other part of it--that part which the pastor--and also you in your hearts- -fervently prayed silently. And ignorantly and unthinkingly? God grant that it was so! You heard these words: 'Grant us the victory, O Lord our God!' That is sufficient. the *whole* of the uttered prayer is compact into those pregnant words. Elaborations were not necessary. When you have prayed for victory you have prayed for many unmentioned results which follow victory--*must* follow it, cannot help but follow it. Upon the listening spirit of God fell also the unspoken part of the prayer. He commandeth me to put it into words. Listen! "O Lord our Father, our young patriots, idols of our hearts, go forth to battle--be Thou near them! With them--in spirit--we also go forth from the sweet peace of our beloved firesides to smite the foe. O Lord our God, help us to tear their soldiers to bloody shreds with our shells; help us to cover their smiling fields with the pale forms of their patriot dead; help us to drown the thunder of the guns with the shrieks of their wounded, writhing in pain; help us to lay waste their humble homes with a hurricane of fire; help us to wring the hearts of their unoffending widows with unavailing grief; help us to turn them out roofless with little children to wander unfriended the wastes of their desolated land in rags and hunger and thirst, sports of the sun flames of summer and the icy winds of winter, broken in spirit, worn with travail, imploring Thee for the refuge of the grave and denied it--for our sakes who adore Thee, Lord, blast their hopes, blight their lives, protract their bitter pilgrimage, make heavy their steps, water their way with their tears, stain the white snow with the blood of their wounded feet! We ask it, in the spirit of love, of Him Who is the Source of Love, and Who is the ever-faithful refuge and friend of all that are sore beset and seek His aid with humble and contrite hearts. Amen. (*After a pause. *) "Ye have prayed it; if ye still desire it, speak! The messenger of the Most High waits!"